Readers of my blog and my book, know that clarity is foremost in my mind when explaining a concept or skill. I believe clarity is key to understanding or learning something new. I also think it is a skill I have worked at developing. Here is my attempt at explaining a complex and time-consuming process. 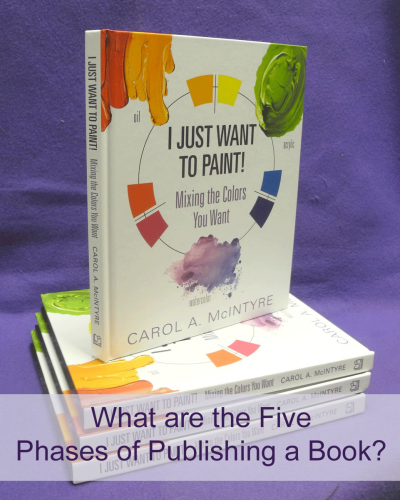 What are the 5 Phases of Publishing a Book? Caveat: I write this article solely from my perspective. I am not a book publishing coach or consultant. I have never seen the process described in phases as I have identified. My book publishing story is about writing a non-fiction book — a how-to art instruction book. I outline the phases I have experienced though many nuances and details of book publishing are skimmed, so consider this an overview. Even though I have portrayed them as a sequence, publishing a book, like any creative endeavor, is not linear and be a bit mushy with lots of overlap. However, I think these five phases represent a model and provide a good framework to take an aerial view of the process. Have You Experienced Post Creation Depression? The title of this blog asks, Have ever experienced post creation depression? It is also called post publication depression or post creation blues or post writing blues or post project depression, and variations thereof. I had never heard of this condition until recently, have you? Last week my final book files were sent off to the printer in China. YIPPEE! I have been working on I Just Want to Paint: Mixing the Colors You Want! obsessively for over a year. I’m supposed to be doing an Irish jig and jumping for joy?! Shouldn’t I feel exhilarated or have a great sense of accomplishment? Instead, lethargy ruled the day. I was greeted with a big surprise. I had hit an emotional and physical brick wall. I could barely smile because all I could feel was total exhaustion and depression. To make things worse, I couldn’t figure out why. What is this? Sure, a little let-down made sense, but this was much more debilitating and my body literally hurt. People around me the past few months had heard me complain of being tired and brain dead, but nothing like this. Have you ever put lots of time and layers into a painting and it just didn’t work out? And, to add to the frustration, you convinced yourself along the way that it was a good painting and that you like it? I call these paintings “problem children.” I do so with affection. Recently, I experienced one of these challenging paintings and thought I would show you the evolution of an abstract painting into a wine painting. The original abstract painting started out on a textured panel 24″ x 28″ x 1.5″ board. First I applied several colors, different textures and collaged a napkin (do you see the tulips?). There are probably 4-5 layers at this point. During the beginning stages of my abstract paintings, I always turn the board around, trying to find where and when I might begin to connect with it. Below you can see it in a vertical orientation. I am liking the drama of it and the mysterious layers that give it depth. The bubble-looking shapes were created with rubbing alcohol. As you can see in Step 3., a few more papers have been collaged, as well as the dripping of paint and circle shapes. I painted in the clouds to create a sense of drifting and more drama. My husband titled it “Carnival Dreams,” which I liked. At this stage of the painting, I am trying to convince myself that I like it. Actually, I only like a few sections of the painting because it is way too busy. I began wishing I could cut it into a couple of paintings, but that isn’t possible with this panel board. A tad perplexed, I put it aside and moved onto the next painting. It needed to go into hiding for a while. After a couple of months, I decided it was time to let “Carnival Dreams” go and to see if I could do something different with it other than sand it down to bare wood. I wondered if I could turn it into a wine painting. To do this, I applied strips of green Frog tape to my panel, and then applied light layers of white paint to imply Venetian-like blinds. I confess, emotionally it wasn’t easy to cover up all of my previous layers. . Step 4. Click the images to see a larger view. When the tape was removed and this was the result. I am liking this but wanted to continue to see how I could transform this abstract painting into one of my wine themed paintings. The edges were softened and more thin layers of paint were applied as seen in Step 6. I still wasn’t sure about my goal, but decided to go for it and so I took on the wine painting challenge. In this next image you can see the charcoal drawing of the wine glass, bottle and a hand. I have also applied a little paint. In Step 8., the forms of the subject have been painted in. I am wondering whether to keep the bottle vague because I want the wine glass to be the focus. Color wise, it was a challenge to not let this wine painting get muddy, so I had to be careful how I applied the purples over the oranges. As you know, purple and orange mix into a brown, which is fine but I didn’t want it too brown/burnt sienna. Learn more about mixing orange and purple in my post What is the Correct Definition of Tertiary Colors? I do enjoy the problem solving of painting glass, because it’s not easy. It is all about using values – the lights and darks – in the correct places. The layers also need to dry in between before I applied the last white highlights. It is not quite finished in Step 8., because I want the glass to pop more. Are you thirsty looking at this wine painting? Ready to have a glass? Step 9. “Let It Pour!” finished 24″x 18″ mixed media on panel painting. You now have a unique view of the evolution of a wine painting or rather, a painting that was not totally satisfactory, and how I tried to resurrect it. This digital photo is not able to reveal the layers below, but you know they are there! Where might you have stopped during this process? Or would you have continued as I did? I hope you enjoyed seeing the development of this wine painting and my problem solving along the way. When have you experienced something similar? Have you documented it? Or perhaps you have a painting you might want to resurrect? Tell us what happened in the comments below. Please share this post with others if you found it helpful or interesting. What is the Complement of Pink? What is the complement of pink? Why is the color pink special? Pink, after all, is a lighter version of red, yet it has its own moniker. When white is added to blue or green or yellow, it is just called light-blue or light-green or light-yellow. The English language doesn’t have a unique name for them. For more information about this intriguing color, visit: A Brief History of the Color Pink. It’s interesting to take a moment every now and then to think about the colors we use. For example, pink wasn’t a noun in the English language until the end of 17th-Century, though Renaissance artists had been using it for “glowing undertones of religious figures.” Next, think of what pink symbolizes in our culture today. To return to the original question, “What is the complement of pink?” What do you think it is? You know that red is the base color of pink, therefore, a guess of some hue of green would be correct. This 12-hue color wheel shows a bright yellow-green as the complement of pink. Have you explored this pair of color complements? They are not seen as often as the more common — orange and blue or yellow and purple or red and green. As you may know, I am a huge of fan of exploring the possible colors that can be created by mixing color complements. Visit my post Complementary Colors Are Dancing Partners to learn more. Mixing color complements not only provide lovely de-saturated colors, they also make each other sparkle when placed next to one another in a painting. In this graphic, if you stare at it for a minute or two, you will see the colors shimmer. My favorite approach to mixing complements is demonstrated in an old YouTube video and described below. I call them 7-Step Chromatic Scales. Here are the steps. Mix a pile or puddle of your two parent colors – pink and lime or yellow-green. To learn more about mixing pink, visit How to Mix Pink? For this demonstration, I used a violet-red as my base color and then added white. Watercolorists just need to add water. Mix a bright yellow-green by using a green-blue, such as phthalo blue, with a green-yellow, such at Hansa yellow light or aureolin. Tip: You will need more yellow than blue to mix your green. Apply a swatch of each parent color on canvas or watercolor paper about 8″-10″ a part. Next mix the middle mixture. Your objective is to achieve a hue – mixing your pink and yellow-green – that does not contain any evidence of either parent color. This takes practice and sometimes patience. The resulting color will be a brown or a gray which indicates that both parent colors have been cancelled. Now mix the two steps between the pink and the middle color. Just add a little bit of the green to the pink and notice how quickly the pink starts to neutralize or de-saturate. 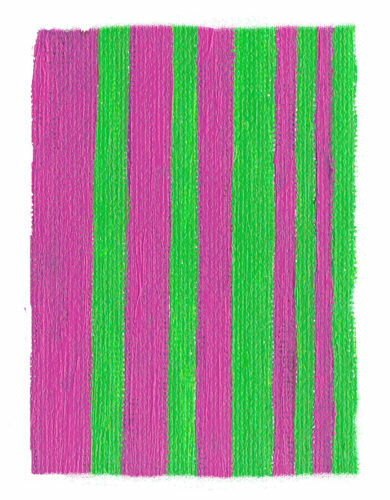 Paint a swatch of this color next to the pink parent color. Then add more green to this mixture for the third step. I like these colors, how about you? Next, mix the two steps of green in the same manner as you did the pinks. Below you see a green swatch with just a bit of pink added to it. This is the completed 7-Step Chromatic Scale. Warning: Your results will most likely be different from mine because the parent colors will be somewhat different. What are your reactions to these de-saturated/neutralized colors? What subject matter lends itself to using the complement of pink? Or perhaps an abstract painting? Are you surprised by the mixtures that can be created? Perhaps this is a good time to explore other pairs of complementary colors? Try it and see what happens. 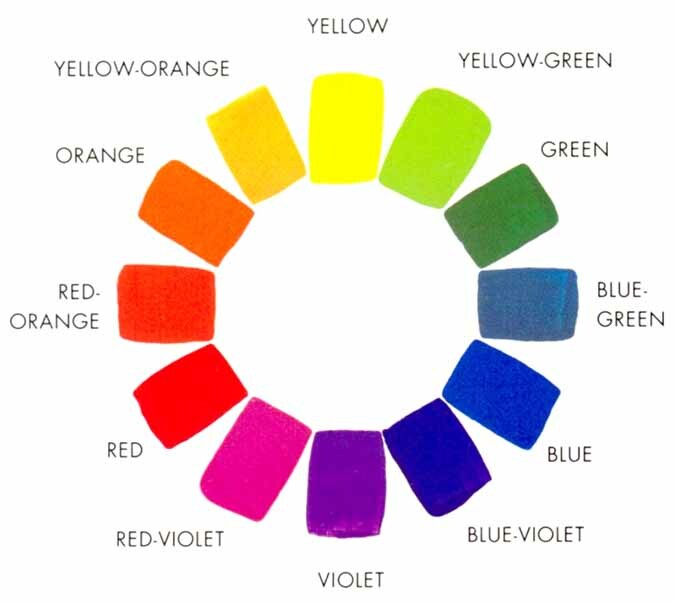 I have had students who claim they have charts of complementary colors hanging around their studios. 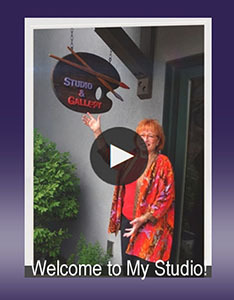 If you enjoyed this post, please share it with your fellow artists. 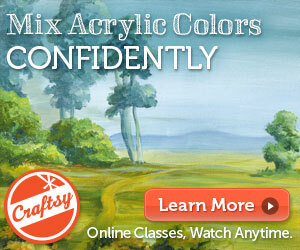 PS Mixing color complements is also covered in my online Craftsy course, Acrylic Color Mixing Made Easy! PSS Stay tuned for my forthcoming book “I Just Want to Paint: Mixing the Colors You Want!” Hopefully it will be available later this fall. 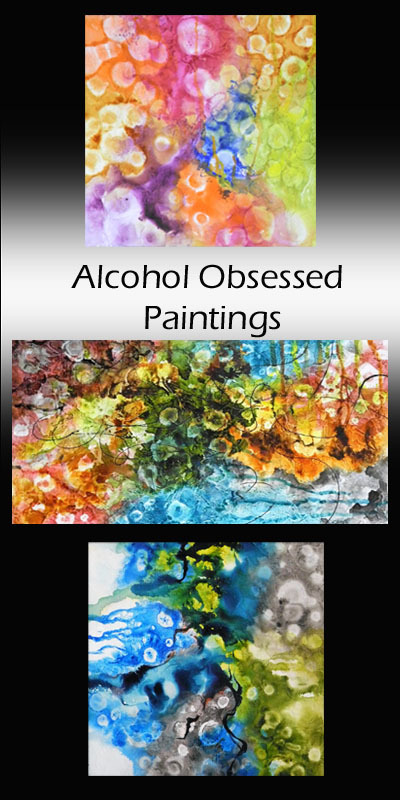 What is ‘alcohol obsessed painting?’ As a creative, do you sometimes find yourself obsessed with some technique or skill that you would like to learn? My latest obsession is alcohol. No, not the kind that comes in a whiskey bottle, but the rubbing or isopropyl alcohol that you can purchase in any grocery or pharmacy for about $0.79. Below you can see the under painting for 3 different paintings where I used alcohol to create amebae-like shapes. You can probably surmise that I am, in fact, obsessed with this alcohol technique! LOL! Many would say that I have gone overboard. How Do I Create These Alcohol Obsessed Paintings? Please let me start out with a qualifier: I have only been experimenting with this obsession for a couple of months, so I know I have more to learn. Your suggestions and experiences are welcomed.